All cutter heads will produce a single knife finish regardless how carefully you grind the knives or position the head. 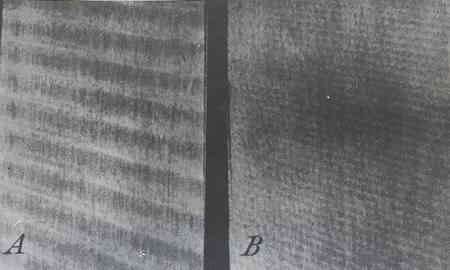 When you position your knives in the cutter head and all knife edges are equal distance from the axis of the head it is still likely you would only achieve a “one-knife” finish. While all knives in the head are making contact with the material and make cuts the knife with the greatest span will cut deeper resulting in the “one-knife” finish. Several factors can influence the depth of cut on a knife. When the cutter head is running at high speeds it can cause distortion to the head or spindle due to balance issues, insufficient strength or eccentricity from ware on the bearings. The only way to get a “full-knife” finish is to joint your knives with jointer stones. Below is a comparison of a single knife finish (unjointed) on the left, and a 4 knife finish (jointed) on the right. The goal of having knives jointed is to run faster and have all knives cut the same depth in the material. A jointed four knife cutter head can run four times faster and product the same number of knife marks than an unjointed head. When jointed a cutter head precision is an absolute necessity. That is why it is not recommended to use a straight bore moulder head when jointing. If you are going to joint your knives confirm that the knives are mounted in a hydro-loc cutter head. Integrated hydro-locking heads have self-centering sleeves (SCS) that allows the corrugated cutter head to be secured directly onto the spindle. Pressurizing the hydro-locking cutter head onto the spindle requires a grease gun that can pressurize up to 400psi and 2nd grade lithium grease; such as Centric Inc. brand HPG2 lithium grease. Hydro-locking cutter heads create a much tighter fit on both the grinder and moulder. The tolerance of a hydro-locking head is 0.000196” (0.005mm) which makes it excellent for the jointing process. Hydro-loc cutter heads in combination with jointer stones will allow you to run much faster feed speed while continuing to achieve the desired finish on your final cut. When it comes to jointer stones think of the old saying, “less is more”. Jointing your knives create a “heal” or flat on the sharp edge of the knife. Opinions vary on when to sharpen these jointed knives but it is generally agreed that you should sharpen your knives when the flat or “heal” of the knife edge reaches 1/32”. Be careful not to over joint your knives beyond 1/32”. Knives that are over jointed will have shorter run life and require frequent sharpening. Lightly jointed knives will result in longer cutting life, sharper edges, and less down time on your machine. 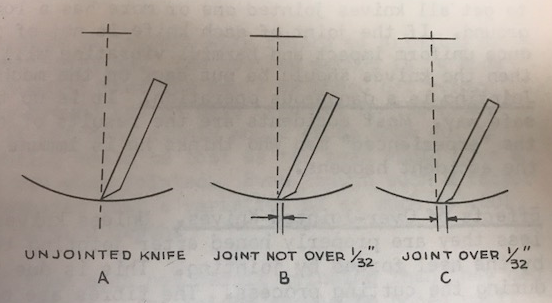 The image below illustrates unjointed, light jointed, and over jointed knives, you can clearly see that the over jointed knife has a duller cutting edge than the other knives. A knife that has been accurately set in a machine that is in good condition with lightly jointed knives; it is possible to joint a set of knives up to six times before they require sharpening. CAUTION: Never joint the knives beyond 1/32" flat. Jointing more than 1/32" causes the knives to hammer and is extremely dangerous, not to mention hard on spindle bearings. When grinding a profile into a jointer stone it is very important that you Do Not use the same grinding wheel that you used to profile your knives. Using the same grinding wheel for your profile knives and jointer stones will result in metal contaminates embedding into the jointer stone that can cause “nicking” on your knives. 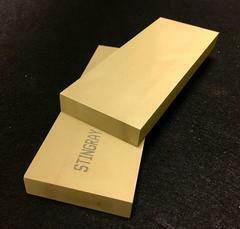 Atlantic brand jointer stones are common and very popular in the woodworking industry. Centric Inc. is excited to offer a drop in replacement for the Atlantic jointer stones; Centric Inc. brand ‘Stingray’ jointer stones. Every Centric Inc. customer who has converted their Atlantic jointer stones to Stingray jointer stones have observed no performance difference and are paying between 10%-50% less for each jointer stone. To learn more about Centric Inc. Stingray jointer stones please call us at 715-848-4242 or visit us on the web at www.centrictool.com.